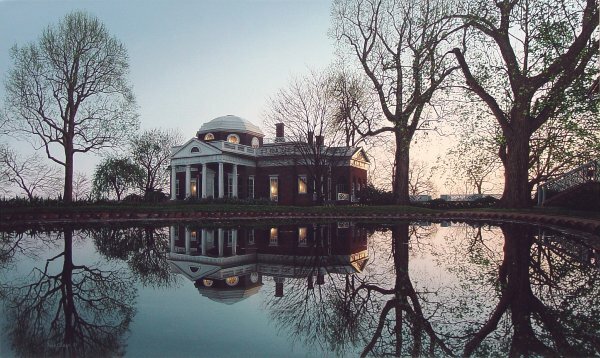 Jefferson’s Monticello features the west front of the house from across a fish pond. The reference photo was shot from a kneeling, almost prone position giving the impression that the pond is much bigger than it really is. Many of the monuments in my work are painted from this low vantage point making them appear larger than life. I "lighted” some oil lamps to create the scene as it might have looked 200 years ago. Jefferson arose early in the morning and would write for hours before mounting his horse to inspect his gardens and farms.